For several months I have been joining Emily over at Chatting At The Sky for her month’s end review. We look back, a big group of other writer/bloggers, Emily and yours truly on some lessons, information or even observations we can claim as “new” in the last month. This is fun, surprising and often very random. Here goes. Um, okay, what have I learned in the past month that I would like to “process” with you. It’s both my way of sharing and processing stuff my brain has stored and registered as intriguing, odd or well, random. 1. It is hard to mess with a classic. 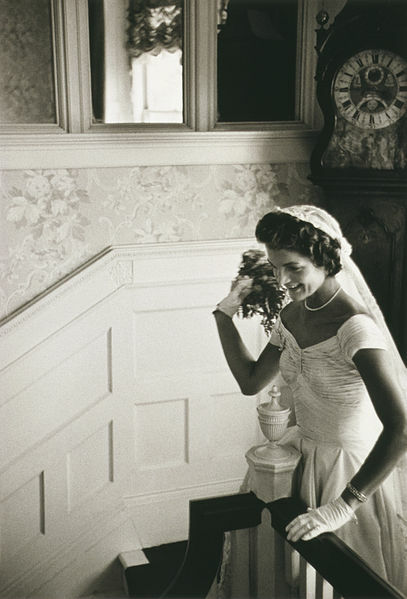 I was perusing Pinterest the other day and nothing stands out more than an exquisite black and white photograph from the 1960’s of Jackie Kennedy Onassis. In a sea of sameness, extreme oddness and wildly fashionable on trend photos, there she is. Well that is also how I see mascara. Odd segway I know but bear with me. If you have ever met me “in real life or IRL” as bloggers like to say, I wear a lot of mascara. And I have tried dozens of brands over the years. It is just really hard to beat the pink and green one. You know which one. The classic, iconic, pink and green “old school” one. So here I am back with the classic. It is kind of like macaroni and cheese. It is hard to beat a good staple, a classic. It is also hard to re-invent the wheel or beauty or the best way to get really black long lashes. 2. Two people can watch the same man for hours on television and have a serious debate over whether the man’s bald head contains a tattoo of hair or real hair braided into a pattern. I swear to goodness unless I google it or write a fan letter to Parade Magazine or The National Enquirer I may never learn the answer. Heck, its going to remain a mystery. Just in case you were wondering, I was the one who thought it was a tattoo. And yes this particular bald head is on “The Voice” on Monday nights. And I can’t keep up with what other nights it comes on, Are you ready for thing three. I thought so. 3. Never underestimate the power of observing things astutely. I am learning this lesson well. I feel it is branding itself into my soul. It is my joy to be approaching Week Five of a twelve week workshop I am participating in through Tweetspeak Poetry. This week we have been writing about and discussing the art of noticing. I am challenging myself to take it a step further as I try to hone my writing skills, particularly my poetry. So beginning October 1 I am joining The Nester for her 31 Days Of Series. I participated last year. You may remember. 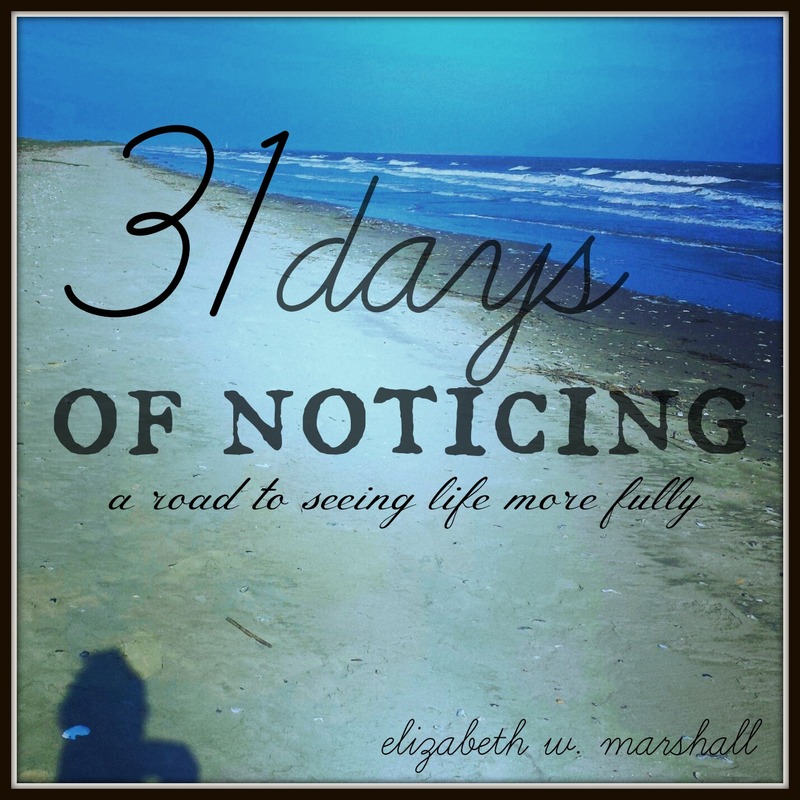 This year I am designing a writing journey entitled 31 Days of Noticing. Oh I hope you will come too. I may notice if you lag behind. Please join me for some or all of this trip into the world of fine-tuning our awareness of the fine points of all that God-beauty that surrounds us. I am excited. (Did you notice I didn’t center the “button” for the series. Just a gentle switch up to see if you are alert and preparing yourself. 4. Sweet and savory things combine forces to make the most delicious salads. Have I included a recipe every month I have participated in this link up at Emily’s. Okay here we go. This one is fabulous. Stop me if you’ve heard this one before. A bed of arugula, topped with watermelon pieces, crumbled goat cheese, fresh jalapenos, sea salt, pepper, heirloom cherry tomatoes with a splash of olive oil and red wine vinegar. You will thank me. 5. I am a big repurposer. I don’t think that is a word but I am going with it. Recently I have found myself back in my car A LOT. If there was a double bold key, that would have gotten double bolded. I don’t think that is proper English either. Anyway, my car is now my thinking studio. And it is becoming my observation on the sky capsule. It is like a planetarium on wheels. You will see clouds and sunsets show up a lot in poetry this fall. And it is where I study the crazy lyrics of songwriters and seek inspiration for my own songwriting. If you would like to review lists from the previous months, I have mentioned my dream of writing songs several times. Okay. I think if I come up with one phrase and repeat it three hundred times I will have a hit on my hands. Example, “you know you want it” and “we’re up all night…..blah blah blah”. Really? 6. I don’t think I ever learned how to conjugate stink, stank, stunk. Just saying. My husband brought home some beautiful flowers the other night. Yes, it was our anniversary. And yes, he does bring flowers home for non-occasions too.! !Ya’ll are just like me. You want to know all the details. (See, we’ll have fun during The Nester’s 31 Day series in October)He opened the plastic sleeve, presented them to me and placed them in a vase. And man did they stink. I mean they really stunk. The whole house was stunk up. It turns out there was something in the soil or in the root system, some chemical reaction which caused the stench. But after they sat in water for awhile, thankfully it slowly faded. I am only telling you in case your husband brings you flowers and they stink. You will thank me. Oh and make sure you thank him and ignore the odor. 7. October is going to be loaded. Like a little too loaded. I am a woman of wide margins, usually, normally typically. It is going to be a wild ride for this chic. I am learning to step out of my comfort zone. You might hear about it at the end of October when I post “Somethings I Learned in October.” That is if you are still around. The best way I know to describe October is when you go through the salad bar and put everything you like on one plate and it all runs together and looks a heck of a lot less appetizing than it would have separately. And it becomes a conglomeration. An amalgamation. And a blur of goodness. Well…..
And if you know how to conjugate stink stank stunk, leave it in the comment section. So much fun! Can’t wait for your 31 days, what you notice, how you interpret it through words. Love the way you “see” from the details of everyday life, pulling poetry out of what others might not even notice. I am along for the ride! I used the pink and green for years until I discovered the orange one. By name: Lashblast by cover girl. I tried a couple others after the orange, but I keep going back to orange. Enjoyed your thoughts… the salad sounds delicious and as for the mascara, I haven’t used the pink and green one since high school (may need to give it another try!) but I love Benefit’s They’re Real! mascara. A little pn the pricier side but well worth it!